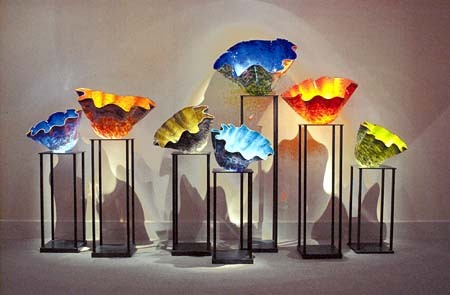 Fourth grade learned about world famous American glass artist Dale Chihuly. They made their own version of his glass Macchia bowl series using plastic! They used a special kind of plastic, Dura-Lar Acetate Alternative, that hold it’s shape after heated up and cooled down, similar to glass. To create their sculptures they chose a color scheme and filled their plastic with patterns using sharpies. Then we folded it into a bowl like shape with paperclips and baked it in the oven for 30 seconds to finish the sculpture. When the paper clips were removed the plastic held it’s new shape! I hung these in the entrance to our school, conveniently located just outside my classroom. They are beautiful! I still have two classes worth of sculptures to bake and hang. FA.4.CR.1.2 Critique personal art based on teacher-established criteria. FA.4.CX.2.2 Apply skills and concepts learned in other disciplines, such as math, science, language arts, social studies, and other arts, in the visual arts. FA.4.CX.1.4 Explain how place and time influence ideas, issues, and themes found in art. FA.4.V.2.3 Create abstract art that expresses ideas. FA.4.V.1.3 Infer meaning from art.